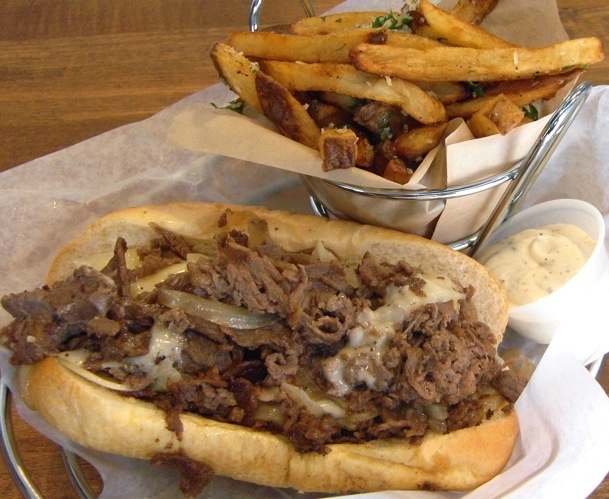 Metro Vancouver Lunch Rush: The American Cheesesteak Co. Looking for a great Philly Cheesesteak in Vancouver? Chef Anthony Sedlak’s restaurant is your best bet. There are 26 7-Eleven stores in Vancouver. Chef Anthony Sedlak discovered more than 2,000 cheesesteak restaurants during a fact-finding trip to Philadelphia — almost unfathomable, isn’t it? With his newfound knowledge, the boisterous Food Network Canada host returned to Vancouver and opened The American Cheesesteak Co., a greasy spoon specializing in its namesake. Day three of business found his new spot swarming. Manning the sizzling grill was newly-tattooed Anthony himself, who chopped wildly to keep up with orders. Being a cheesesteak rookie, I went with the traditional Philly — though, Le Bifteck with caramelized onion jam, double cream brie, and dijon did look mighty tempting. The sandwich’s shaved rib eye meat weighed as much as a small lapdog. Equally great was its flavour. Partnered with ACC’s fresh baked bread, draped with melting provolone, it was a winner. Apparently, steak plus cheese does equal love, as the spot’s slogan states.